When we test SQL Server stored procedures or functions there may be situations where one object (for example, stored procedure) calls another object (for example, a scalar function). In this case we have dependency between objects. One of the method to test the functionality of dependent objects is to use fake objects, i.e. we use a stub function instead of a real one. In this post I’ll show how to substitute a function with a fake. I’ve created a very simple function that multiply an integer value by 2. 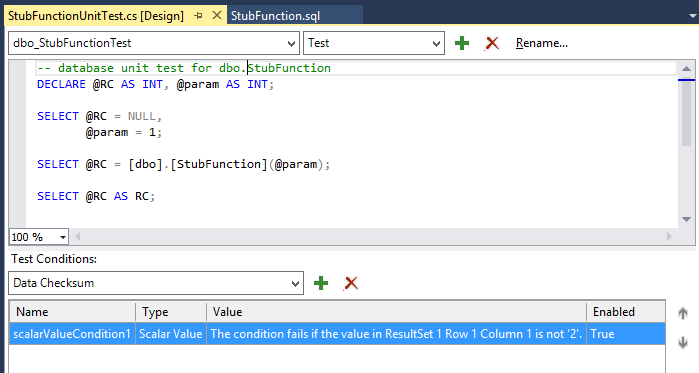 I’ve created a simple unit test for that function in SQL Server Data Tools with the only test condition to check that 1 * 2 = 2. My test passes. Now I want to replace my function with a fake that will always return a value 2. 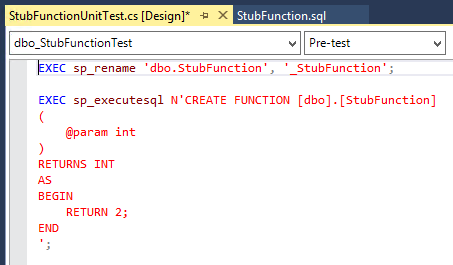 This can be made in pre-test section by renaming the real function and creating a stub. It does not check the existence of a new function name and it does not delete it. If this new name already exists, the unit test throw an error. You can’t create a stub function with a direct CREATE FUNCTION command due to an error in SQL batch. Therefore, I use a wrapper to execute SQL command dynamically. In post-test section I safe-delete my stub function and revert the name back. The test passes. That’s all right! Using a fake object allows us to test each database object separately but it needs some efforts from a developer.